Soccer Brace | Marathon Orthotics, Inc. The Richie Soccer Brace® is a custom ankle brace that incorporates a shin-guard for soccer practice and competition. This brace is a specialized version of the Richie Brace®, a custom articulated ankle foot orthosis. The Richie Soccer brace includes custom, balanced functional foot orthosis articulated at the ankle with a semi-rigid ankle brace. Most ankle braces do not fit comfortably into cleated soccer shoes. Most ankle braces limit ankle plantarflexion-dorsiflexion movements vital to proper kicking and control of the soccer ball. Most ankle braces cannot be worn comfortably with standard shin-guards required of competitive soccer players. The Richie Brace® is custom molded to a plaster model of the patient’s foot. Tight conformity, and thin polypropylene materials assure minimal displacement of shoe fit. Custom placement of ankle hinge allows pure sagittal plane movement for un-restricted ball control and kicking. At the same time, complete restriction of abnormal frontal (inversion) and transverse (internal-external) rotation is provided by the footplate and limb-uprights. The molded anterior tibial shin guard fits inside the limb uprights for compact fit, while allowing total functional movement of the brace. 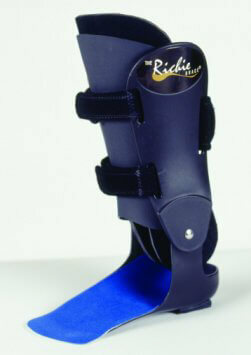 Follow the standard Richie Brace® casting protocol with plaster splints or use the STS Ankle Sock. Please provide a circumference measurement of the calf for proper fitting of the shin guard.